The labor market was upbeat in April due to the high proportion of working persons to the total labor force, the National Economic and Development Authority (NEDA) reported on Thursday, June 9. The number of employed Filipinos registered at 39.9 million, comprising 93.9% of the total labor force, in April 2016, results of the latest Labor Force Survey (LFS) of the Philippine Statistics Authority (PSA) showed. 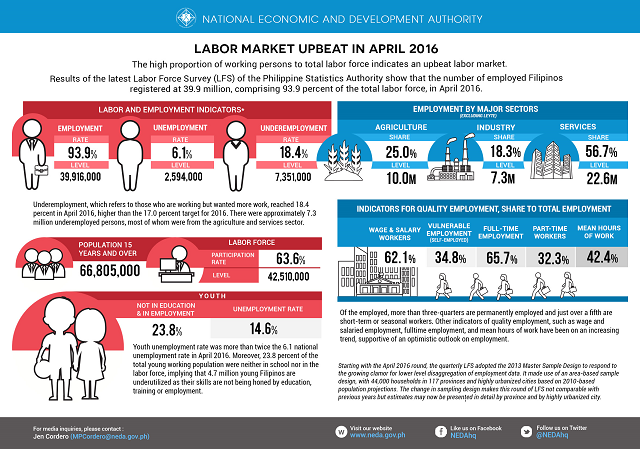 Partly attributed to election-related activities, the April 2016 employment rate is at the high-end range of previous April rounds of the LFS since 2011, NEDA noted. Of the employed, more than three-quarters are permanently employed and just over a fifth are short-term or seasonal workers. Other indicators of quality employment, such as wage and salaried employment (24.8 million or 62.1% of total employed); full-time employment; and mean hours of work have shown an increasing trend, supportive of an optimistic outlook on employment. Unemployment rate is at 6.1% in April 2016, equivalent to 2.6 million unemployed persons or about 0.4 percentage points lower than the full-year target of 6.6%. “If the labor market trends are maintained, the Philippine Development Plan target of 6.5%-6.7% for unemployment rate in 2016 is likely to be achieved,” Socioeconomic Planning Secretary Emmanuel F. Esguerra. 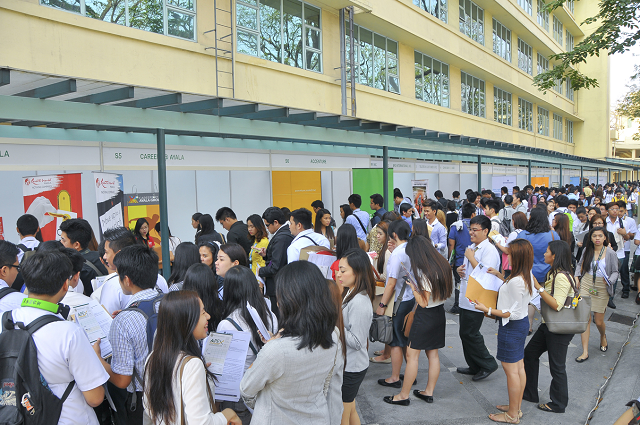 Youth unemployment, however, is alarming, Esguerra warned. Youth unemployment rate stood at 14.6%—more than twice the 6.1% national unemployment rate in April 2016. Some 23.8% of the total young working population were neither in school nor in the labor force, suggesting that 4.7 million young Filipinos are underutilized as their skills are not being honed by education, training, or employment. Underemployment, which refers to those who are working but want more work, is also relatively high at 18.4% in April 2016, higher than the 17% target for 2016. There were approximately 7.3 million underemployed persons, mostly from the agriculture and services sector. Thus, the incoming administration needs to create the conditions that will produce more high quality jobs, including easing the country’s foreign investment restrictions, noted Esguerra. Improving the business climate is key given the need for resiliency and adaptability to changes in the labor market, he added. The country also needs to focus more on income security rather than job security by producing a better trained and agile workforce while exploring more flexible work contracts and unemployment insurance/savings schemes that will support this type of employment. Access of our farm workers to technology should be improved to help them shift to more suitable and high-value crops. The same can be tapped to create crops that can survive adverse weather conditions like La Niña, which may develop within the second half of 2016, the NEDA chief added. Globe Telecom, Inc. on Thursday said it secured the go-signal from the Metro Railway Transit (MRT) to deploy wireless Internet infrastructure in all MRT Line 3 stations—for the passengers’ benefit. Globe said in a statement that it signed a memorandum of understanding with MRT, an attached agency of the Department of Transportation and Communication (DOTC). “In line with the two organization’s commitment to continuously improve the lives of its customers and the Filipino people in general; this partnership is a milestone that is expected to improve the experience of the public riding the MRT, including those in the communities surrounding the MRT stations,” Joel Agustin, Globe senior vice-president for program governance, network technical group, was quoted as saying. Globe is also planning to roll out this year around 200 cell sites utilizing the 700-megahertz (MHz) spectrum. Over the weekend, it fired up the first 700-MHz cell site, located near the Hardin ng Bougainvillea in the University of the Philippines - Diliman campus in Quezon City.